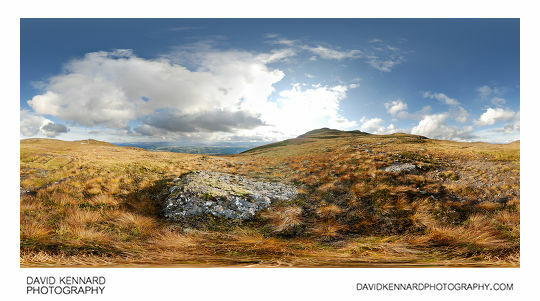 I just recently finished processing some panoramas I took on a walk up Meall Fuar-mhonaidh during my Scotland holiday in October 2011. Meall Fuar-mhonaidh is a large hill / small mountain, which is classed as a 'Graham'. It is located on the west shore of Loch Ness. We did have a problem with getting there, the Google GPS directed us into a small car park just off the road that goes round Loch Ness. But this wasn't the car park that we were meant to be in according to the Meall Fuar-mhonaidh walk instructions we'd got from Walk Highlands. The Google GPS said that we needed to carry on driving up the track at the end of the car park, but it was a forestry track, not a road. So instead we decided to walk up the track. After a while we turned off down the track in the panorama below. There were lots of branches and stuff in the way along the track. So we were glad we didn't try to follow the GPS instructions and drive along it. Also, we later found out from a local that this is actually a private track. Anyway, it was very nice walking along this track in the morning sunshine, with all the trees in autumn colours and the birds singing. For the panorama above, I did make a curves adjustment to warm the colour temperature a bit, as this is more how I remember it being. 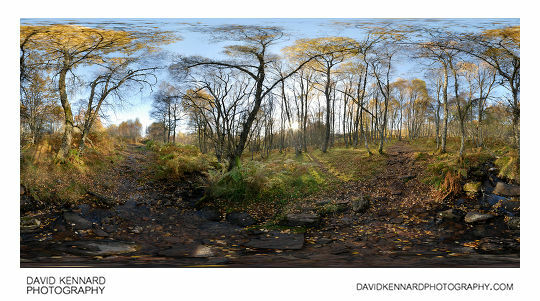 Before you get on to the main part of Meall Fuar-mhonaidh, you have to walk through some Birch and Hazel woodland, shown in the pano above. One thing I noticed about the woods around Loch Ness is that there seems to be masses of Lichens everywhere. I would guess it's due to the damp air. On the way up to the top I didn't take any more panos as the weather wasn't that great (clouds would keep blowing across the mountain). Also, we mainly wanted to try and get to the top rather than stopping too much. I knew I could take panos on the way back down again. The above pano was taken at the top, which is 699 metres above Sea level. You get a good view of the surrounding area, and are meant to be able to see out to Ben Nevis. I'm not sure if you can see Ben Nevis in my pano though, it might be obscured by clouds. I was quite lucky that the cloud started to clear and we got a bit of sun when we reached the top. I actually shot the above pano twice. The first time was before the sun came out, then when the sun came out I thought it was worth re-taking it. 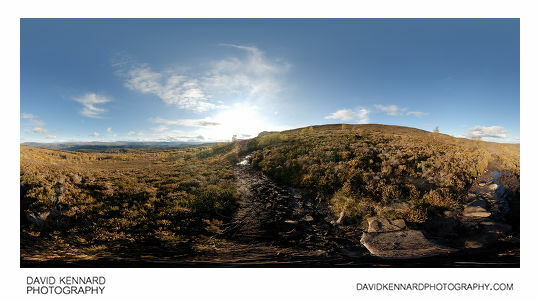 This pano was taken when the sun was behind the clouds, comparing it to the one taken at the real summit you can see what a great difference the sun makes. The above pano is taken at a lower summit. 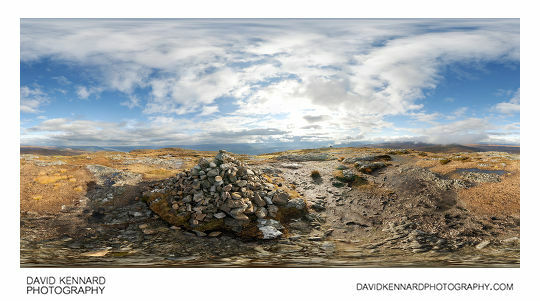 There are a number of cairns on lower summits as you climb up Meall Fuar-mhonaidh. It is quite annoying as you think you are just about to reach the summit, but then when you get there you can see there is another higher summit a bit further on ahead. 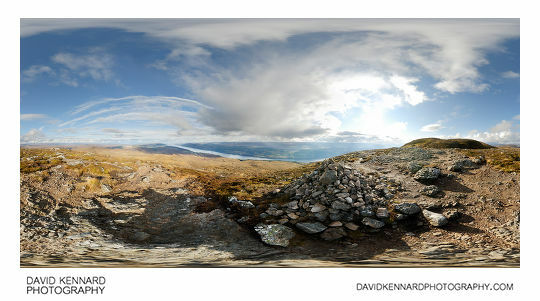 The pano above was taken at yet another lower summit. I think this one might have been the lowest one that had a cairn. You can see a bit more of Loch Ness in this one. 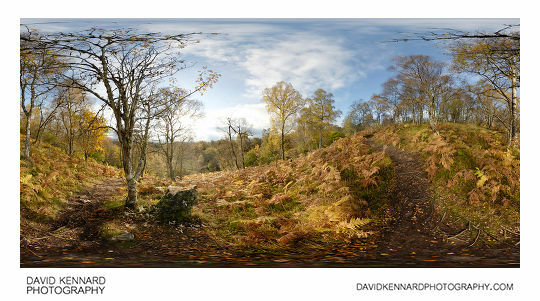 I really like the orange-brown colour of the grass in the pano above. The route up the mountain was really boggy, and you often had to take diversions around large pools of water. I did actually slip over once, and my Canon 18-55 lens that was on my camera at the time still has bits of Scottish bog stuck in the ridges on the zoom ring! Nearer the bottom of the mountain the flora is mostly heather. The path here is also much more well defined, and less boggy than it is further up. I'm not sure why there are no trees apart from at the bottom of the mountain. It may be that any young trees are eaten by deer. 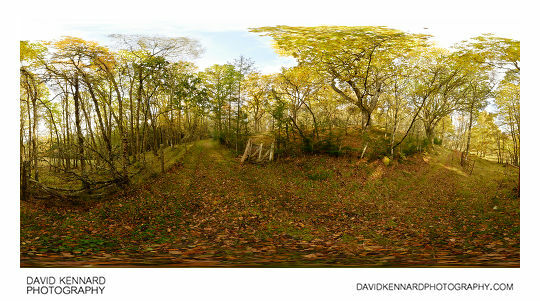 And the last one, this was taken down in the woodland near the bottom of the mountain again. Unfortunately the zenith (up image) for the above panorama was rather blurry. I'm not sure how that happened, since the camera was on the tripod. Maybe I didn't lock the pano-head down and the arm moved during the exposure. Or maybe I nudged the focus ring when moving the camera. Anyway, I think the panorama is better with a blurry zenith than none at all. Of course, this could have been avoided if I had checked all the shots were sharp and in focus at the time. But that would add quite a bit of time to do that with every panorama I shoot. 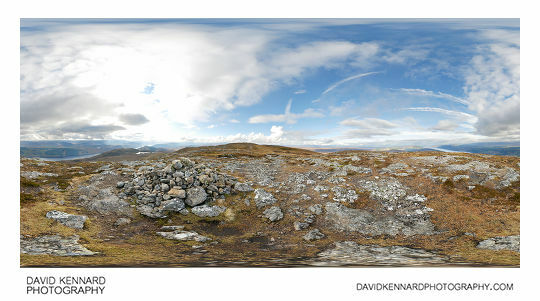 Despite the slippy bog, Meall Fuar-mhonaidh was a very nice day out and a good walk.